Confused? No, you're absolutely right, these two cars don't belong together. They're not competitors and they never hang out as friends. So why bring them here? Well, because it's 2018, and the news these days is all about autonomous electric cars and ride-sharing apps. Life is getting safer and more sterile and we all use hand-sanitisers and drink filtered water and conkers are classified as dangerous weapons. Speed is bad, loud exhausts are frowned upon and overtaking on the public road is now likely to provoke a furious reaction in people, similar to how they'd behave if they saw you clubbing seals or torturing bunny rabbits. But in the midst of all this – when enthusiasts like you and me are wondering if we might have to pack it all in and take up stamp collecting or (God forbid) football – these two arrive. Two new cars that share the same purpose, and I don't just mean wishy-washy 'driving fun'. It's deeper than that. These two are both built to thrash: find a good road, clear your mind of distractions, and wring their scrawny necks until your palms sweat and the fuel tank is drained. They unashamedly celebrate petrol engines, do-it-yourself steering and the nuances of a Michelin tyre. Unless you have actually been collecting stamps or playing football the last couple of years, you'll know about the Alpine. 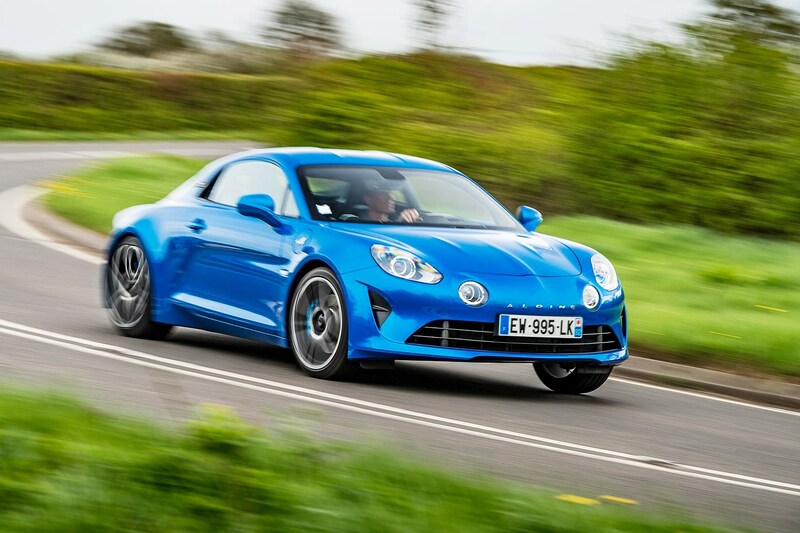 Revived by Renault and inspired by the Alpine A110 that won the first World Rally Championship back in 1973, this bright blue sports car is new from the ground up, and powered by a mid-mounted, 1.8-litre, turbocharged four-cylinder. Alongside it is a hot hatch with a much newer, brasher reputation to defend: the new Ford Fiesta ST. 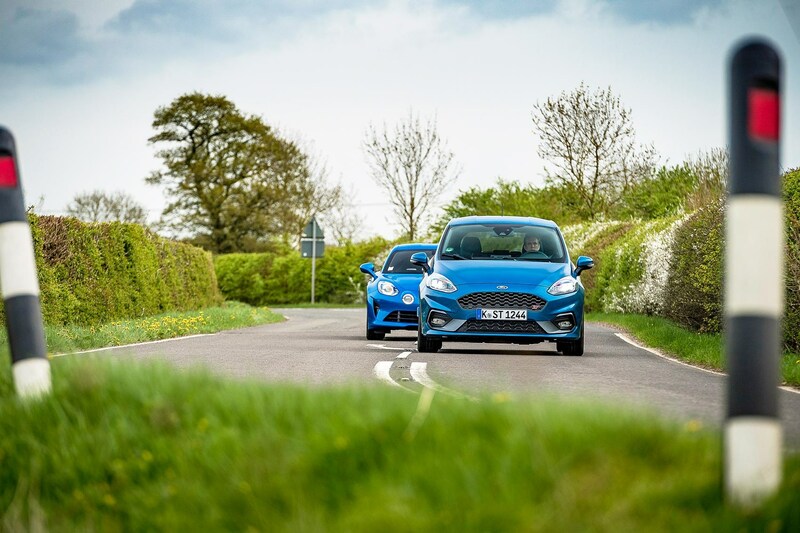 It follows in the footsteps of the 2012 Fiesta ST, a car that caught everyone by surprise with its defiant, giant-killer attitude and amazingly cohesive dynamics. The new car hopes to repeat the same recipe, with a revised chassis, an improved interior and – controversially perhaps – a new 1.5-litre turbo triple, replacing the 1.6-litre four-cylinder. 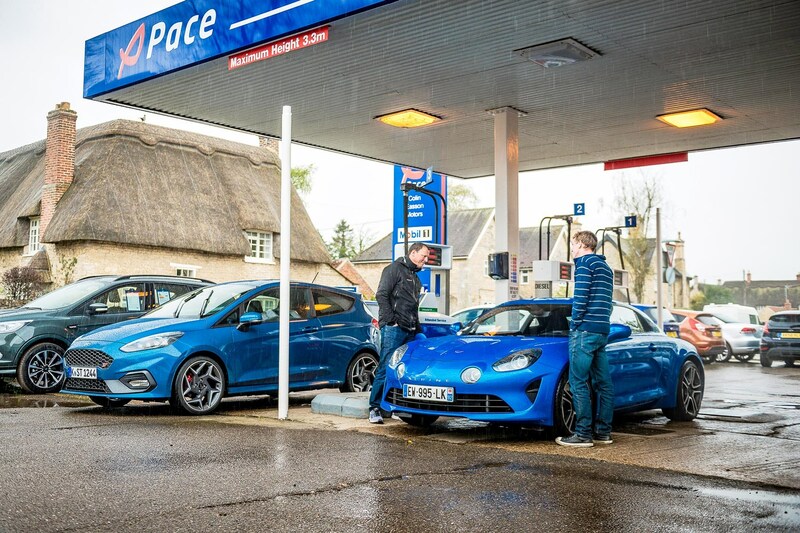 The new three-door Fiesta is only four metres long and under two metres wide, but when you approach these two parked side by side it's the Alpine that appears to be the delicate miniature. The French car is a tiny, lovely thing: 20cm lower and 14cm narrower than the Fiesta. It's 20cm shorter than a Porsche Cayman, its more typical playmate. The A110 is also a strikingly unusual shape. By following the styling of the original A110 – a car that dates back to 1961 – the new car has proportions and details that I don't think any modern car designer would dream up, if they started with a blank sheet of paper. Like those quad lights on the nose, mimicking the rally lights of the original, or that long, swept-back tail that originally wrapped a rear-mounted engine, though it now contains a little boot. Add in little details like the rear badge, made up of individual chrome letters, and the Alpine fuses modernism and classic appeal without spilling over into pastiche. If the exterior styling is a success, the interior is a triumph: the lightweight door swings open to reveal a two-seater cockpit, narrow and low-slung and full of character. From a mass-market make like Renault, it's a surprise the bean-counters allowed such playfulness – like the deep, fixed-back race seats with their diamond-pattern stitching, the arching centre console, the toggle switches and metal foot plates. Sure, the stalks are straight out of a Megane, but they don't detract from the overall impression of a low-volume car. That vivid, metallic blue 'A' in the centre of the steering wheel persuades you: this is something new, something different and original. The Fiesta's interior is, of course, a world away from such luxury detailing – it's less than half the price, after all. But like the Alpine it too screams 'DRIVE ME!' as soon as you open the door. The interior is a significant improvement, with a cleaner dash dominated by a big colour touchscreen. The Recaro seats hug your sides and allow you to sit deeper in the car than the old ST, and the leather steering wheel is flat-bottomed, fat-rimmed and full of promise. Sitting in the ST is like holding a perfectly weighted baseball bat in your hand – suddenly you have an overwhelming urge to swing it. I like the exterior styling of the new Fiesta, with its a scowling fish-face and honeycomb grille. CAR's James Taylor reckons it looks like a miniaturised Galaxy – a grown-up, one-box shape with understated rear lights – which he doesn't see as a good thing. It certainly looks more mature than the outgoing car, and if you deleted the ST badge it wouldn't stand out much in traffic. But don't be fooled by its low-key appearance – on the right road, this little gem could embarrass a supercar. And no, I don't mean the Alpine when I say that. 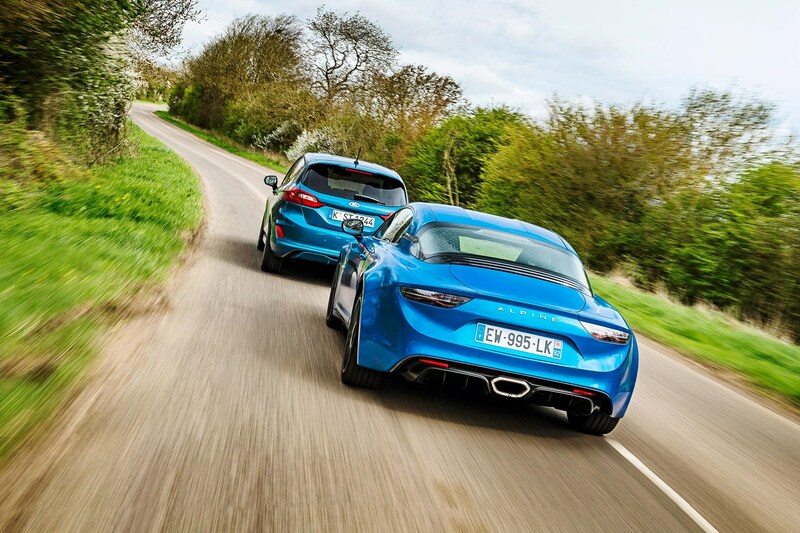 Despite its mid-engined layout and head-turning looks, the new A110 isn't a supercar: producing just 249bhp, it can't even match the hottest of hot hatches in terms of raw power. But don't worry, because it makes the most of what it has with an extraordinary kerbweight. From the outset, the Alpine engineering team took a Lotus-like approach, fretting about every last gram. That led to some big, fundamental decisions, like the all-aluminium chassis and body; and some little decisions, like those Sabelt sports seats that weigh just 13.1kg each, and the handbrake built into the main rear Brembo caliper, saving another 2.5kg. The result is an unladen weight of 1080kg in standard trim, and 1103kg for the car you're looking at here, one of the limited-edition launch cars. That's 250kg less than a PDK-equipped Porsche 718 Cayman. That kind of dedication is refreshing, when everything seems to gets bigger and flabbier. Lightweight cars create a virtuous circle: lightness means narrower tyres, smaller brakes and softer springs, and so it is with the Alpine. Climb in and settle into the wonderfully snug bucket seat, and press the big red start button under your elbow in the centre console. The 1.8-litre fires with a snarl behind your head and ticks over with a low burble. Although this engine can be found in the new Renault Megane RS, Alpine says the intake, exhaust, and turbo systems are all unique. It drives the rear wheels through a seven-speed Getrag paddleshift with both auto and manual functions – so pull back the right-hand lever and you're off. Within 100 metres of travel you notice the most remarkable and distinctive thing about this car: the electric power steering almost feels unassisted, it's so loose and free and light. Most manufacturers equate sportiness with artificially stiff steering, as though all that sticky, rubbery grip at the front is travelling up the steering column to give you a big, beefy steering effort in your forearms. Grrr! Macho! Trouble is, it never feels real – the fake stiffness just feels like the rack is trapped in a vice, lined with banana skins. 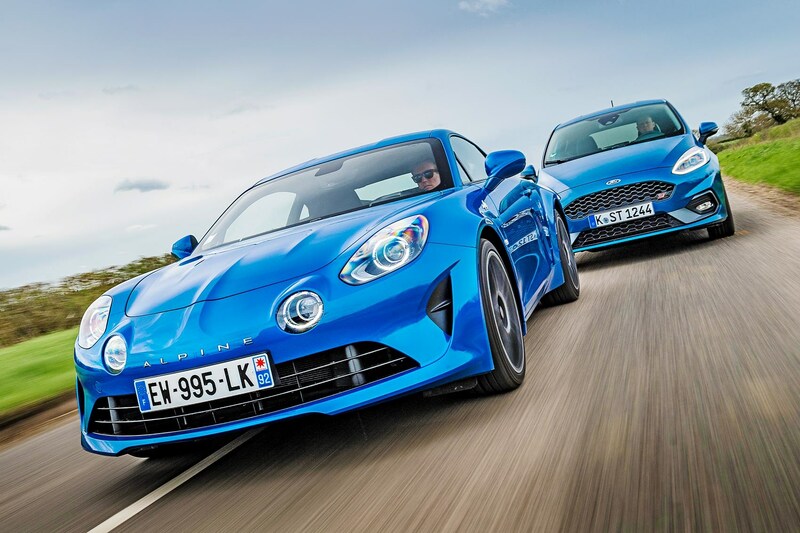 The Alpine takes a completely different route: its steering is light and limber, spry and sharp, but not over-assisted or numb. It's restless, constantly jogging and jiggling in your hands as the car follows the road, communicating its lightness beautifully, lending the Alpine its own distinctive character. Within minutes, you understand this is a key appeal of the car – the thing you'll mention first, if someone asks you what it's like, the factor that might well make you choose it over a Porsche. It is nothing short of sensational. The ST's approach couldn't be more different. The last-generation Fiesta ST was a tight little fist of a car. It somehow pulled off a careful balance of confident composure with playful adjustability, but it also suffered from a rock-hard ride that made your head wobble on your shoulders, and the engine was powerful enough, but a bit vanilla. 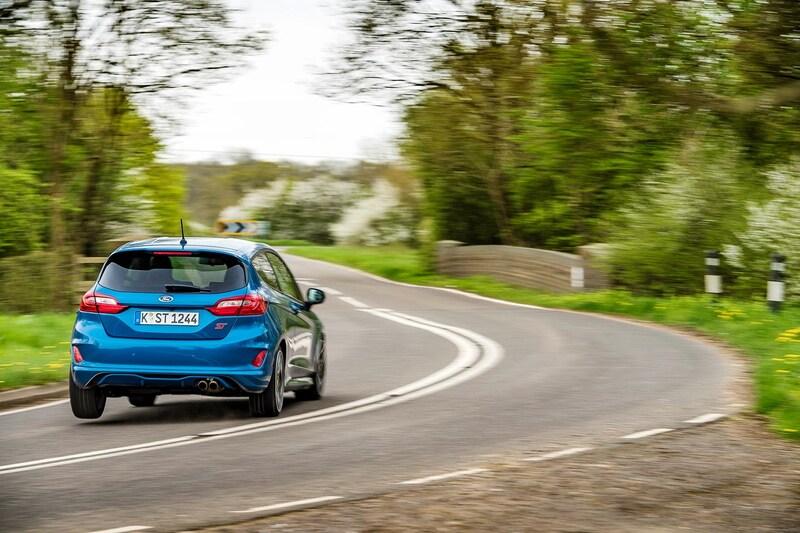 Ford promises it has fixed both complaints in the new model with some impressive jargon: the suspension now features 'non-uniform, non-interchangeable, directionally-wound force vector springs'; and the 1.6 four-pot is replaced by an all-new 1.5-litre, three-cylinder EcoBoost that puts out 197bhp at 6000rpm, the same numbers as the last iteration of the old car. On that notoriously hard ride, the new car may have softened a bit, but without driving old and new back-to-back it seems very marginal – this is still an incredibly stiff ride, the compromise you have to make to access everything else. 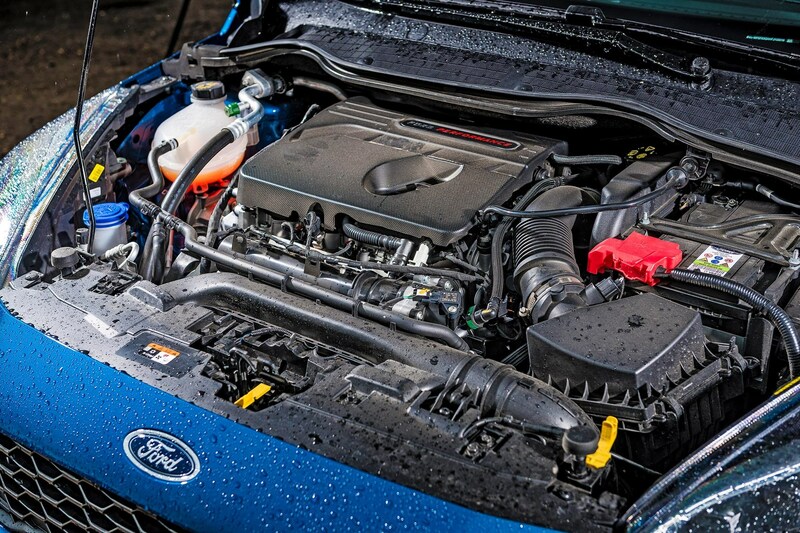 But the new power unit – wow, Ford has performed miracles. Despite its three cylinders, this is an exhilarating wasp of an engine, full of energy and enthusiasm. The way it propels the car down a road defies belief, losing nothing in terms of speed over the old car, yet it's gained so much, in terms of personality, a better soundtrack (thanks to an active exhaust valve and a bit of electronic manipulation) and better fuel consumption, thanks to pioneering cylinder deactivation – when you're cruising, it's actually a frugal 1.0-litre twin. Not that you'll be cruising much, because the good news is the core appeal of the ST remains undiminished: this car loves to be spanked. There are changes over the outgoing model – the track is wider, the monocoque is torsionally stiffer, the steering is faster; but importantly, it all still works as a cohesive whole. You hustle it into a bend, stand on the brakes, quickly drop through the manual gearbox and pitch it in. The turn-in bites so immediately, so confidently on the Michelin Pilot Super Sport tyres that the swerve of the nose introduces a whiff of yaw, bringing the tail round to tighten your angle. If that sounds unnerving, it's not. It's playful and adjustable but always under control. Now, as you accelerate out, the new ST deploys its secret weapon: a mechanical limited-slip diff that ensures none of your 197bhp will spin away uselessly. 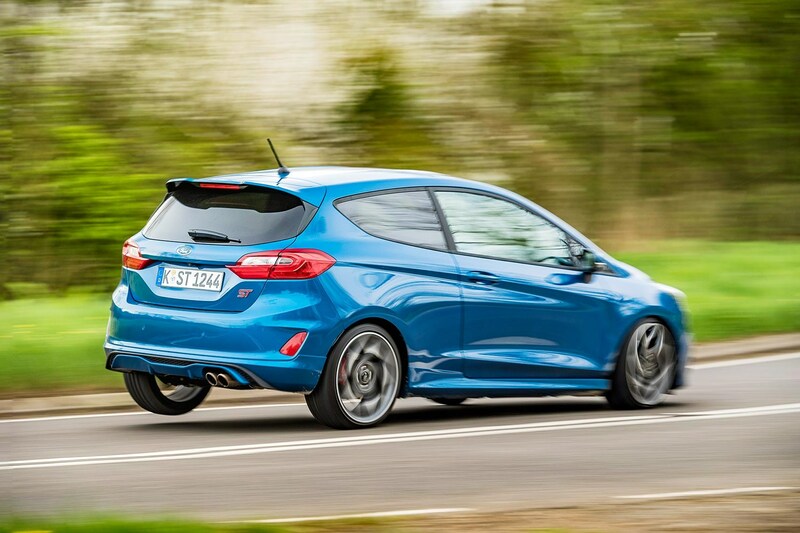 Available as an option, it helps catapult the ST out of tight bends with little scrub and modicum of torque steer. There's even a new 'flat shift' function that allows you to grab the next gear without dipping the clutch. All this means that the Fiesta ST really can keep up with an equally thrashed Alpine on a twisty road, which is impressive. However, the A110 driver is enjoying a very different driving experience. 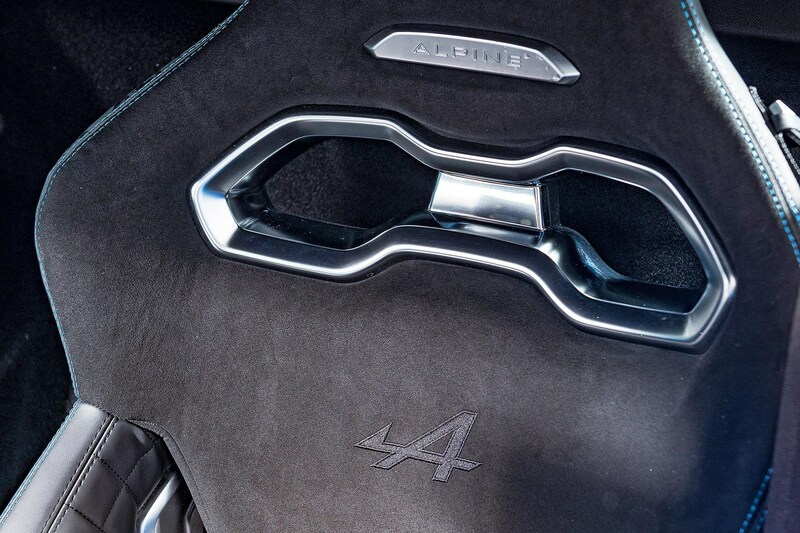 Like the ST, the Alpine has three driving modes, Normal, Sport and Track. As you switch up, everything from throttle response to gearshift and exhaust note are changed, but importantly not the ride, which is perfect as it is. 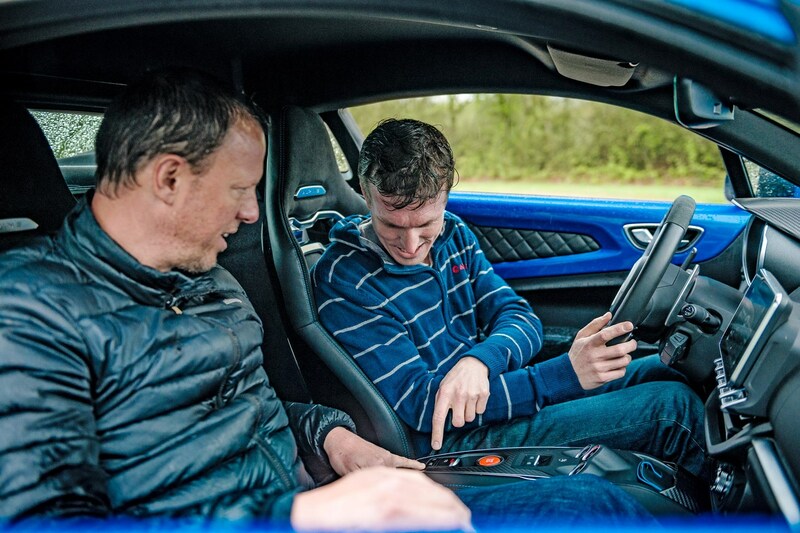 I drove the A110 in Track the whole time – it allows purely manual gearshifts, it makes a great noise and the digital display gives you a beeping shift light. That means you can concentrate on the important stuff, like the way it accelerates with a faint lag but still powerfully in every gear, the exhaust growling on the throttle and popping loudly off it. Turn-in is just as sharp as the Fiesta but – counter-intuitively perhaps – the Alpine doesn't have the oversteery feel of the Ford at speed. Instead the handling is definitely set-up for safe understeer if you prod the throttle mid-corner. It can be provoked, of course, with a hard lift, but it takes commitment. Drive it clean and fast, and the traction (aided by a 44:56 rearward weight bias) will just see you power cleanly out of even the tightest of bends. At first I felt a pang of disappointment at this, because I love rear-wheel drive, but then I had to give myself a slap – it's not all about banzai tail-sliding stuff. Is it? No. You sure? No, really, it's not. 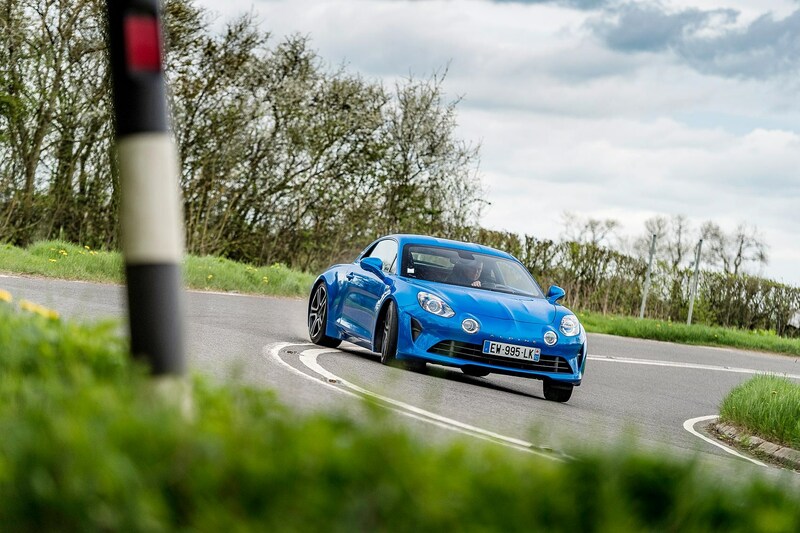 The Alpine feels best when you drive it hard but you keep it neat, revelling in that amazing steering, the feedback through your hands, the way it responds to your smallest inputs. We're so lucky to have these two cars. I hope they find success – the Alpine is expensive, and the ST is far too stiffly sprung for your average Fiesta shopper. But I think they'll carve out a cult appeal in their respective markets. I hope so – enthusiasts like us need cars like this, to keep the faith, to prove we don't have to give up our steering wheels just yet. And I hate football.